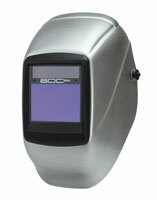 The Tigerhood Futura XXL welding helmet delivers the largest wide-view, distortion-free auto-darkening filter lens with the highest quality optics available in the United States and Canada. With a total viewing area measuring 10.2 square inches, the XXL model provides a 40 percent larger viewing area than standard auto-darkening filters. The helmet comes ready to use with a choice of attachment systems.